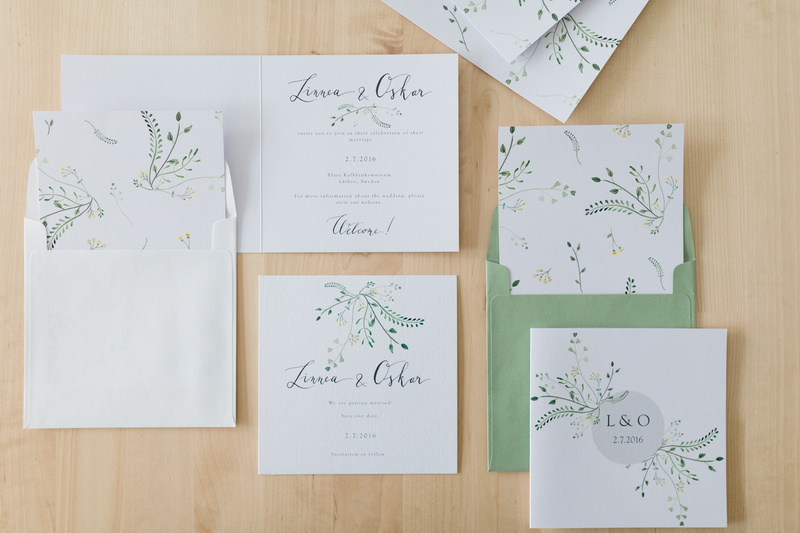 In the last weeks I have been asked about logos, calligraphy and even tattoo-projects, but most of the time the questions were about wedding invitations. I am always so thrilled to receive messages, because it´s nice to see that there is interest towards handmade stationery and calligraphy. However, I think there are some useful aspects to know about handmade designs, so I decided to dedicate a post for the topic. However there is an important part in each and every design, that stays sort of “invisible”. It´s time. Developing something handmade equals investing a lot of time into the process. As 90% of my work is based on hand drawn elements, I spend hours with sketching / erasing / testing / calligraphing and painting. For an invitation suite, I add watercolour elements as well, which I draw and paint sometimes with several layers. If your dream is a delicate flora and fauna wreath sketch, I can make it with the ink color of your choice. 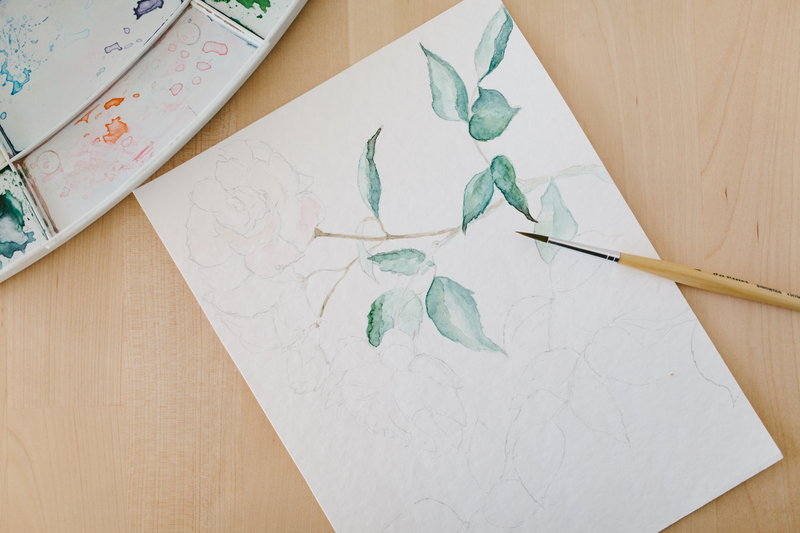 If your wish is a realistic rose bouquet painting, or a simpler abstract color-blend, that is also possible to make. After these elements are finished, comes the digital process. Scanning / “cleaning” / editing / resizing, etc. All in all, it´s not ready at one fell swoop. But when the design is already digital, things get easy to send them to production and print. Getting back to answering one of the questions, of course it is possible to make invitations one by one. 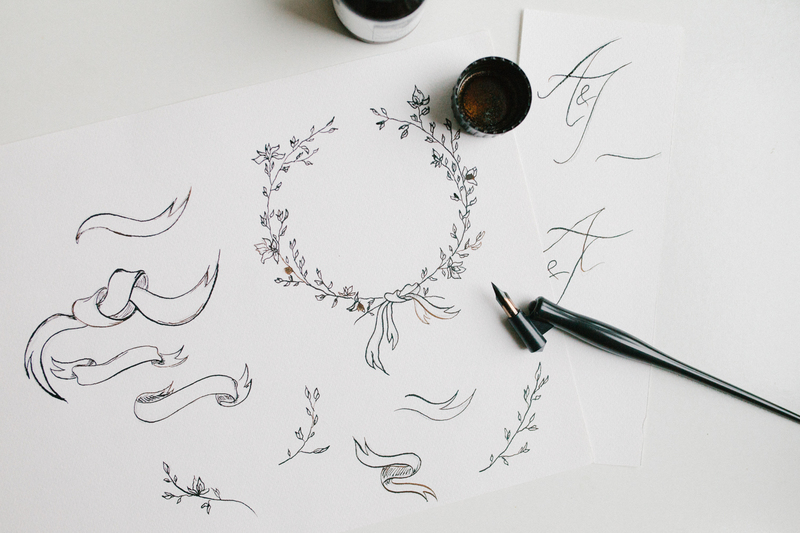 I see very famous calligraphers (including my favourites) doing it each and every day, like the incredibly talented Tara Spencer from Septemberletters. 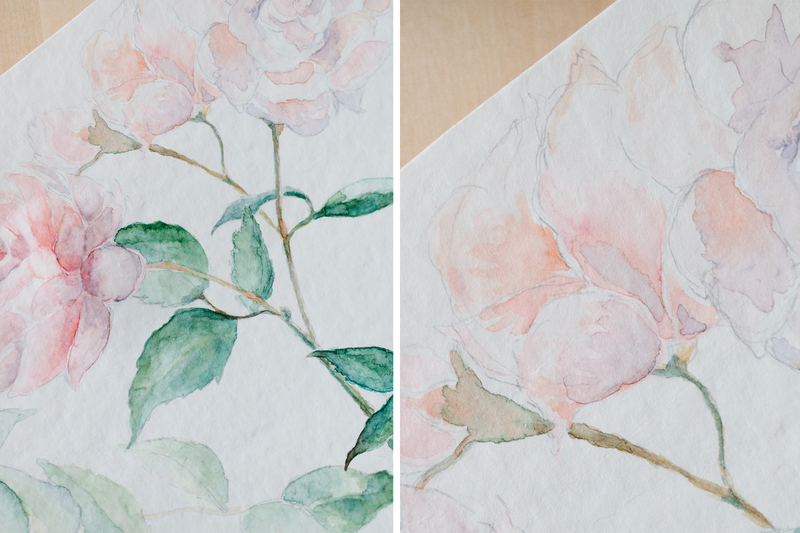 I admire her beautiful, airy designs on delicate cotton paper and I love the ethereal elegance that her work reflects. But preparing 30-50 pieces of invitations & envelopes one by one requires a lot of time, precision and a higher wedding budget. And here is the question that I also received some time ago. Is it really worth having handmade designs? I would say, that it is completely up to your personal preferences. Probably when you see handmade stationery designs you will be able to decide whether or not it is your cup of tea.